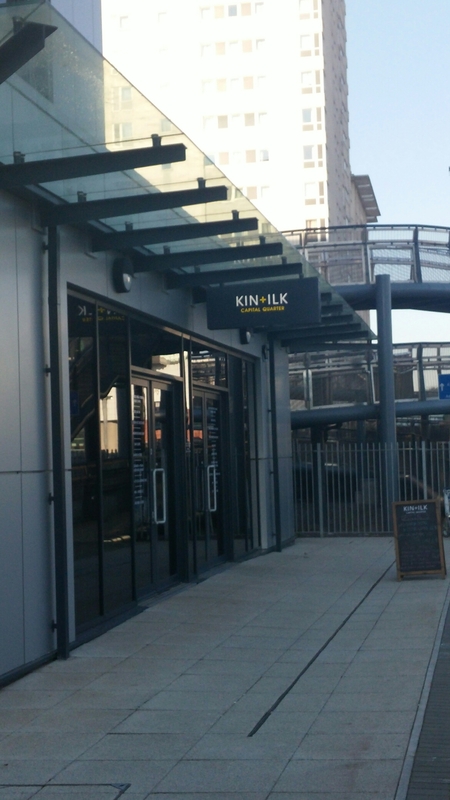 A couple of recommendations led me to KIN+ILK, (thank you @callycupcake10 and Eve England), a cafe/wine bar located in the newly emerging Capital Quarter in Cardiff (part of a seeming obsession with Quarters in Cardiff and indeed many other cities). 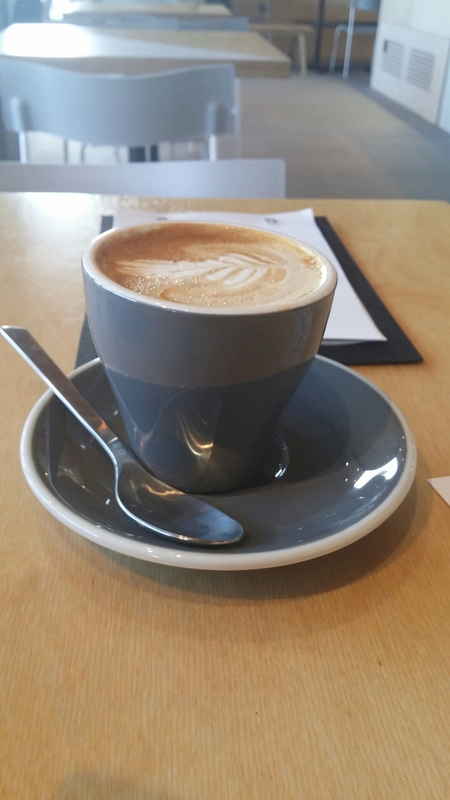 The emphasis is on local produce on the food front and a decent wine list (as well as local beers and proper coffee and tea) on the drinks front. A sign located outside suggested something a bit different from your normal sandwich bar/cafe. I went in with the expectation that I was in for a bit of a treat. It is quite unassuming on the outside and very, what I would call, Scandinavian/”Ikea” (they will probably hate me for saying the latter – sorry I have no sense of style at all am afraid) on the inside. There are some nice design features, including innovative plug sockets with inbuilt USB sockets so you can charge devices even if you only have a USB lead with you. With their free WIFI this makes for a nice spot to relax and surf the net with a coffee or a glass of vino. 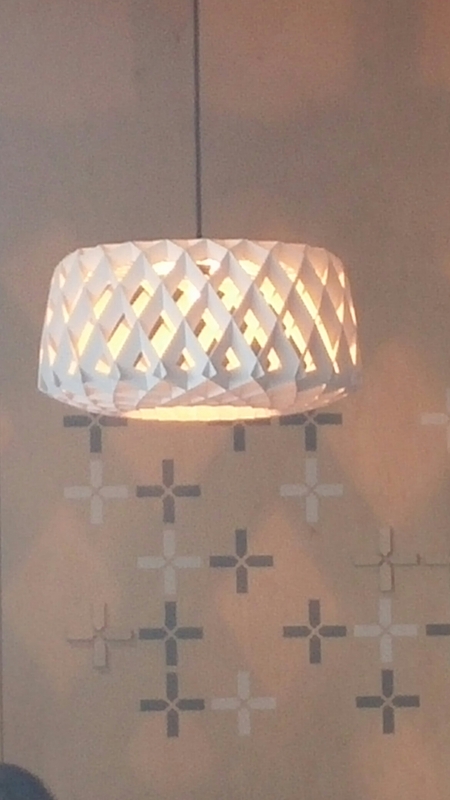 I loved the funky light fittings and really rather want some for my house. All in all a nice place to while away some time. 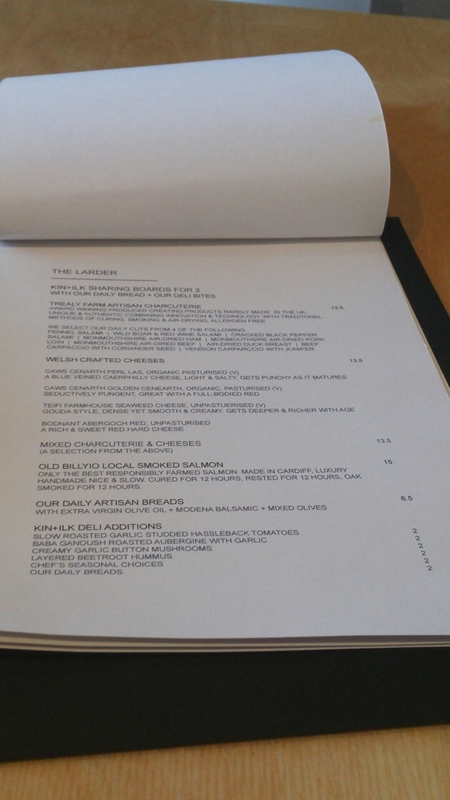 The food/”larder” menu is a mix of classy sandwiches, savouries and sharing platters, with a real local/Welsh producer emphasis. For those that frequent the wonderful Riverside Farmers’ Market, the menu is full of stuff from old friends in the form of Trealy Farm, the Parsnipship (for veggie and vegan stuff) and (more recently) Pontcanna based Old Billyio Smoked Salmon. 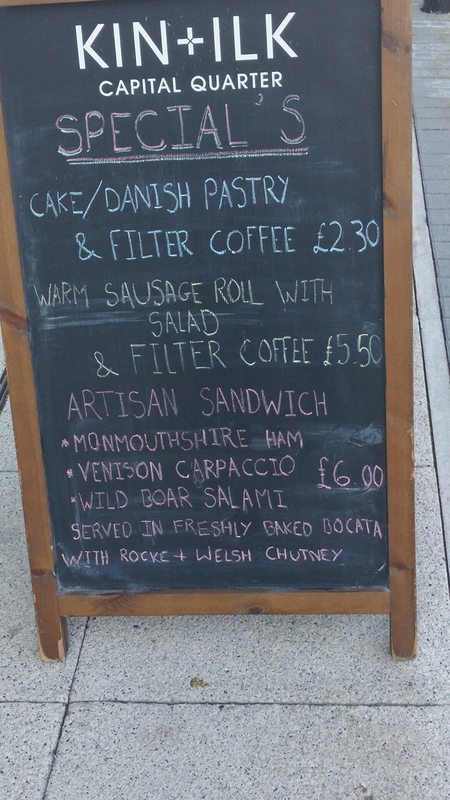 Meat based savouries and the bread used in the sandwiches are from Keltic Artisan Bakery, a bakery based in Cardiff Bay. 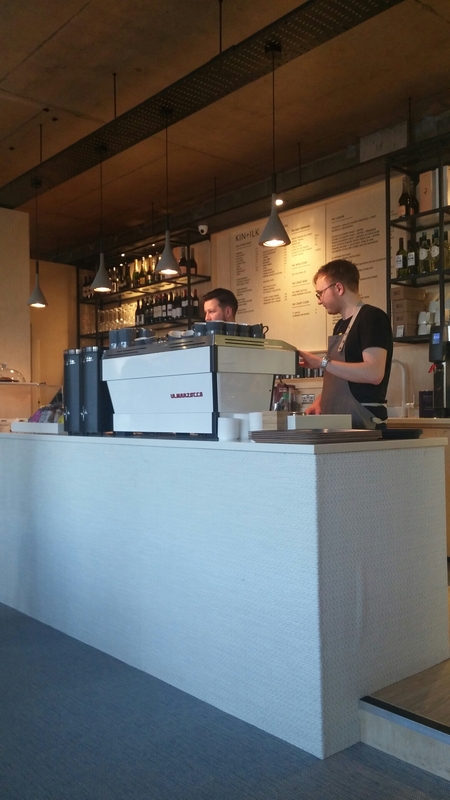 It is lovely to see this place putting such a focus on local artisan producers. It didn’t take me long at all to decide what I was going to have, having been sold immediately (on seeing the board outside) on the venison carpaccio bocata (£6), with the venison coming from Trealy Farm. 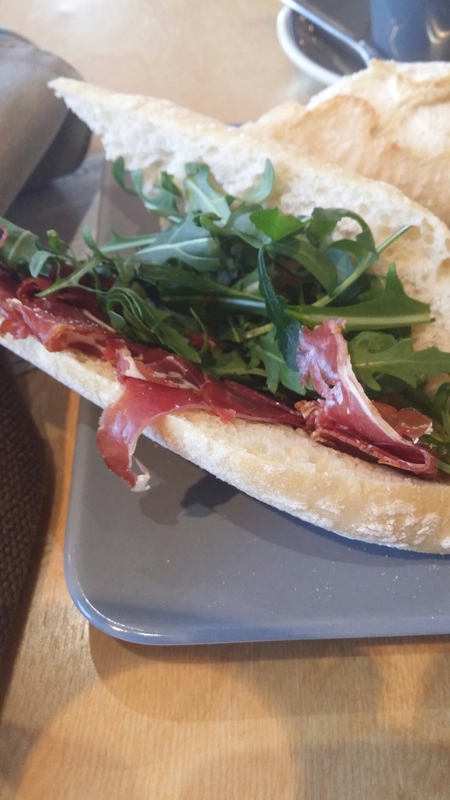 A lovely sandwich, with a generous filling of wafer thin cut cured venison, which had a pleasant gameyness to it with just a hint of juniper adding nicely to the mix. It was encased in a light, but very tasty bocata bread. 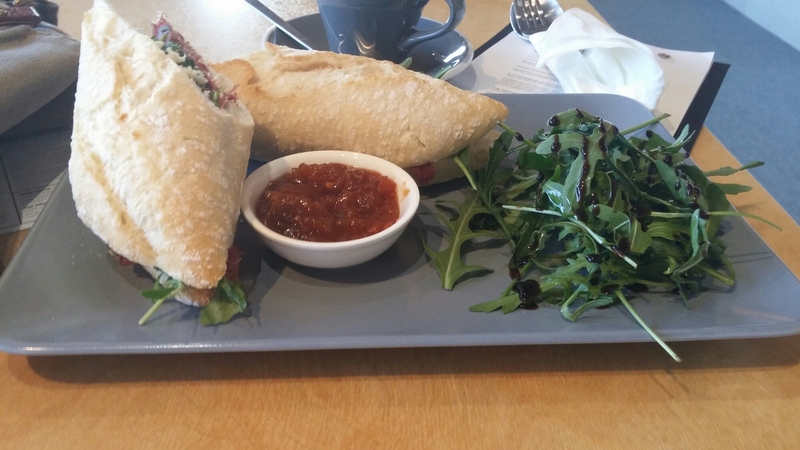 My sandwich came with some peppery rocket, a quality balsamic dressing on the rocket and a nice punchy and very moorish chutney on the side. Some may think it a bit “dear” at £6 (sorry couldn’t help myself), but the core ingredient here doesn’t come cheap (£4.65 per 70 grams retail, according to one site . It is a fair bit cheaper if bought direct from Trealy Farm , I have been told, mind – £3.60 for 60g sliced, half that if unsliced ) and they did not skimp on the filling. My only (very minor) criticism would be the doubling up of rocket in the sandwich and on the plate. I like rocket, but it was a bit rocket overload. All in all a very nice sandwich and worth the money in my view. 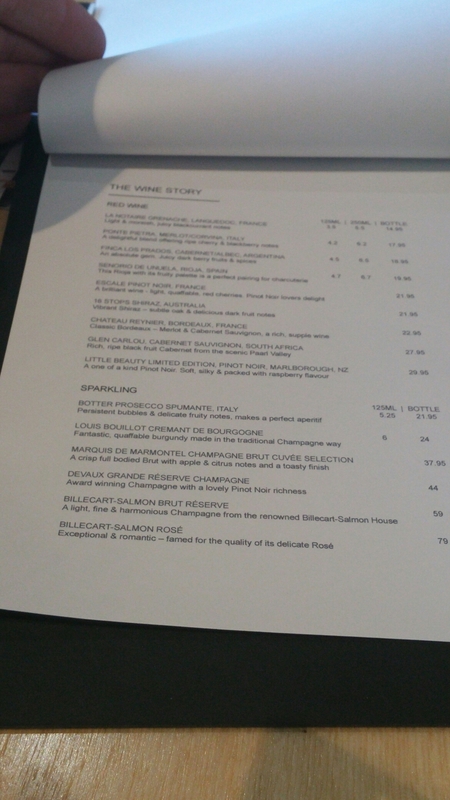 a cremant from Burgundy in the fizzes (it would have been good if there had been at least a Welsh fizz on the list mind – plenty of decent ones around) and a couple of Pinot Noir wines (and interesting cab sav from South Africa from Glen Carlou) in the reds. Beers on offer continue the local theme, coming from Newport’s Tiny Rebel and the Llandiloes based Waen Brewery. They also had a good selection of teas and soft drinks. 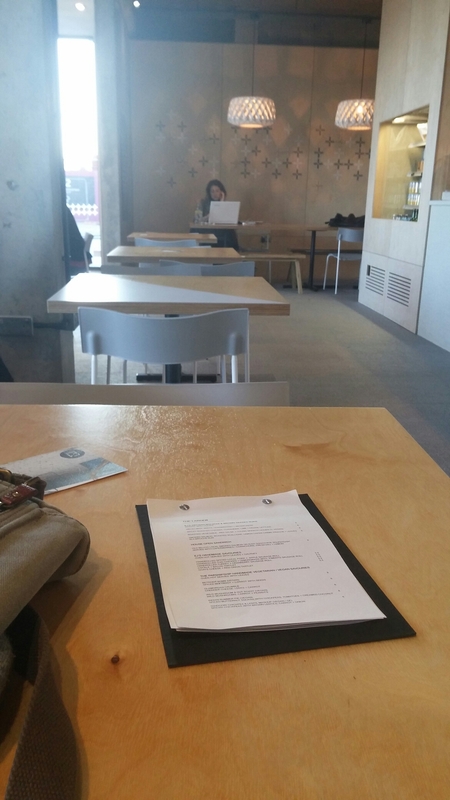 Great little place and a welcome addition to the lunch time venues within reasonable proximity of my office. The wine offering also makes it a good option as an early evening start off point before town. The 7pm closure time does limit my options somewhat- oh to finish work before 7pm on a regular basis- on that front a tad. They do, however, seem to hold a fair few interesting events in the evenings mind. The service was very good with staff well trained and, from a chat with one staff member, knowledgeable about the products on offer. Would I go back? Definitely – as the post title suggests it is exactly my kinda place. I really hope they succeed – not 100% sure about location though, as it is still early days for the Capital Quarter. It was pretty busy mind on my visit during a mid week lunch hour, so off to what seems a good start. It seems they already have plans for further branches in Cardiff Bay and Pontcanna. Website: Currently only their Facebook page. Oh snap! 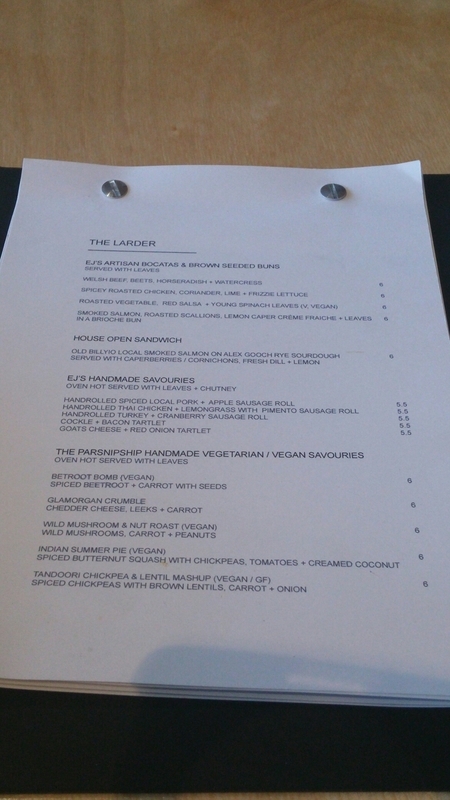 When I was looking at the photo of the board and pretending to choose my order, I too went for the venison carpaccio. I’m a completely sucker for game meat and any possibility of having it rare… cured is good too! Dare I bring London into the picture but I think £6 would be a bargain in these parts considering it looks fairly sizeable and is well filled!  – was very good and as you say well filled. Trealy Farm stuff is always quality. 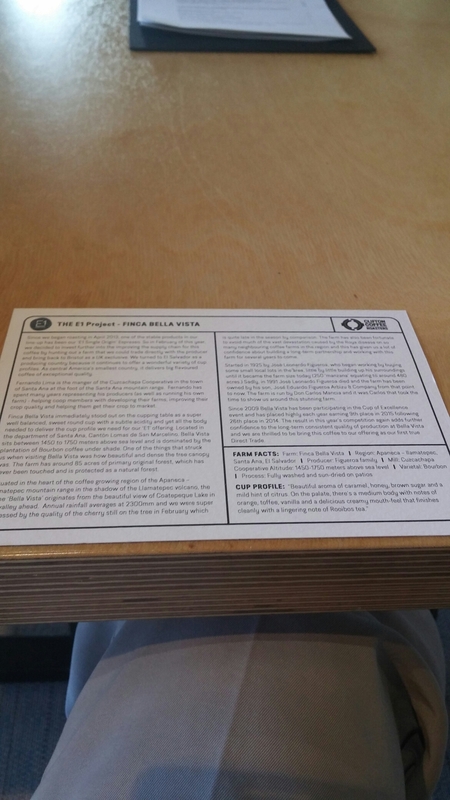 I raised price as was very scathing in prevous post on a US burger joint on size versus price. I think for what got here it was very good value . 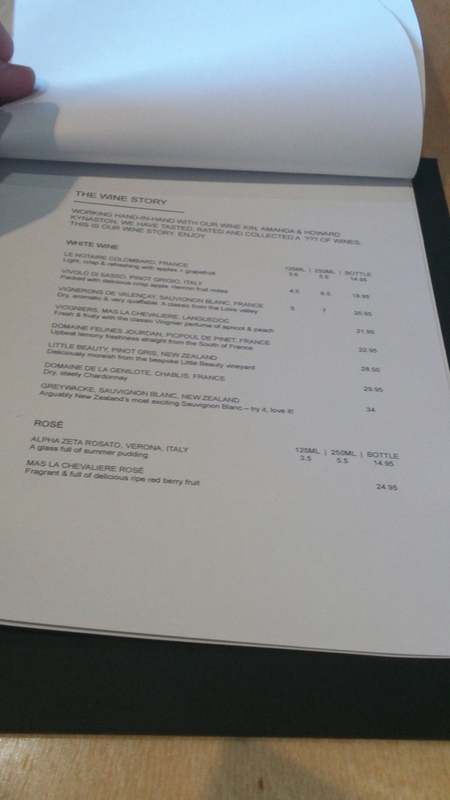 This entry was posted on Jan 31, 2016 by solicitingflavours in Cardiff, Cardiff restaurant, charcuturie, cheese, cider, Clifton Coffee, coffee, craft beer, Drink, Dry white wine, Food, Food and wine products, France, French wine, Kin + Ilk, lunch, lunchtime, New restaurant Cardiff, Non alcoholic drink, Red Wine, Restaurant Review, review, Sandwich, Tea, Trealy Farm, vegetarian food, Wales, Welsh food, White wine.